If you’re a developer and have ever tried to market your own app or website, you’ve most likely discovered that the biggest challenge isn’t the building but the marketing of your app. When trying to come up with creative ways to spread the word about my weather extension, I came across Justin Jackson. Justin has a great story (video) of how he has been able to go independent selling books and courses on helping developers market their products. He offers a lot of free content with some great tips and strategies. He recently started updating his book Marketing for Developers that has sold nearly 5,000 copies. I wanted to cover some of the techniques he used to market his own products to developers. Below are some excerpts from the first email titled “Didn’t want you to miss this”. I received on 8/11 from Justin about his relaunch of his book. You’ll notice his emails are personal and targeted to the potential customer. This opening paragraph will catch the eye of the target customer for Justin’s book. He includes several links throughout the email to his product. By letting you know that almost 5,000 people have already bought this book, it must be good. 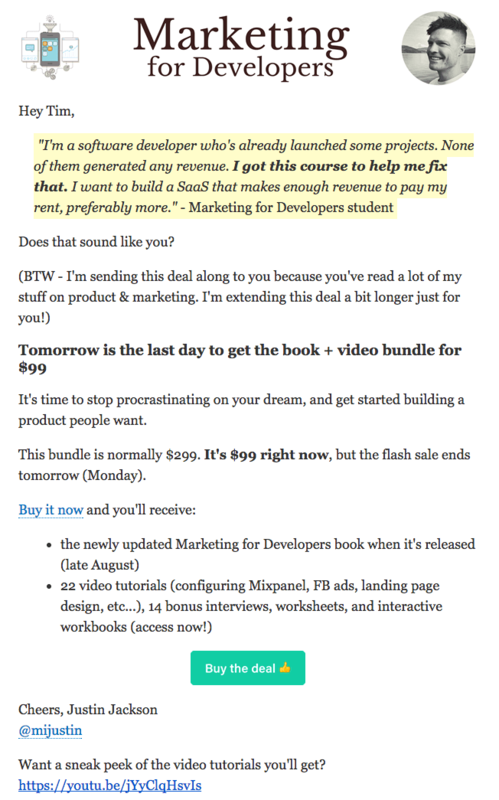 Finally, he lets you know who this book/course is for with quotes from current customers. To sweeten the deal, he offers a great discount that is limited for the next 24 hours. This gives the customer a sense of urgency. Time-based deals are a great way to prevent a customer from saying I’ll do this later. He even included this countdown timer that is quite entertaining. He also includes two call-to-action buttons in middle and bottom of the email to make it easy for customers to know how to purchase the book. Finally, if you’re not convinced to purchase, he has a video at the bottom that explains the book/course. Two days later I received the second email titled “Last chance to get the book + video bundle for $99”. This email followed a similar format as the first but was shorter. A follow-up email is a good tactic because most emails are never read and the second one may get your customer’s attention. Go check out Justin’s twitter feed, and you’ll notice he started promoting that he was updating the book long before the updates were complete. It’s always a good idea to get the word out about a project you are working on. It will let people know it’s coming. I would recommend getting a landing page up and start collecting emails as soon as possible. Justin has done an amazing job at marketing himself and his products. You should definitely check out his stuff!